A bit of group history – The Mersey Morris Men originated in 1960 from the merger of the Liverpool Men (founded 1928) and the Wirral Men (1953). The history of the original teams has been traced back to the 1930’s in some detail. Before this, evidence and references have been much harder to trace. However, various men have been busy and believe that confirmatory evidence will be unearthed for the highlights of Morris history on Merseyside. When the first Mersey road tunnel was opened by George V on 18th July 1934, the Wirral and Liverpool Men both danced in procession through the tunnel from their respective ends and then danced together under the Mersey. When the Victorian Overhead Railway (now long gone) was first opened in Liverpool in 1888 by Her Majesty, the Morris Men were there – and Victoria was amused. More details can be found on our website. Cotswold – This represents the central core of the group repertoire with dances from a variety of individual Cotswold traditions. Rapper – Sword dancing from the North East England, using flexible two-handled swords. Molly – Dancing from East Anglia is most associated with Plough Monday, the first Monday after Epiphany. 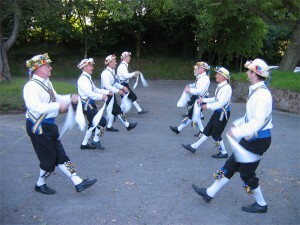 Tradition has it that as a way of filling the gap between Christmas and the start of the spring ploughing season, the ploughboys would tour around the village landowners, offering to dance for money. The dancers, wishing to gain employment from those same landowners shortly afterwards, would attempt to conceal their identities by blacking their faces with soot and dressing up in a modified version of their Sunday best. Our costume – consists of white shirts and black breeches with flower-decked hats. Over the shoulders are worn blue and gold baldricks, centred by a badge showing the Liver Bird carrying the Wirral Horn. Membership – New members are always welcome. So, if you are interested in learning to dance, playing some music or just being sociable, please get in touch. Traditional local events and festival participation – God’s Croft Beelzebubbers are a wholly-owned subsidiary of Mersey Morris Men and perform the Frankby Play every other year as part of the annual Mersey Morris Men’s Famous Boxing Day Revels on December 26th in Willaston.